سورۊ زایارٱیی: "For The Gambia Our Homeland"
گامبیا یٱکؽ ڤلاتٱ کاْ ها د ٱفتانشیݩ هوم پاٛڤٱن آفریقا ، پاتٱخت اؽ ڤلات شٱئر بانجۊل ٱ. ↑ ۱٫۰ ۱٫۱ National Population Commission Secretariat (April 30, 2005). "2013 Population and Housing Census: Spatial Distribution". The Republic of The Gambia. https://www.gbos.gov.gm/uploads/census/2013/Spatial-distribution-report_%20Final.pdf. 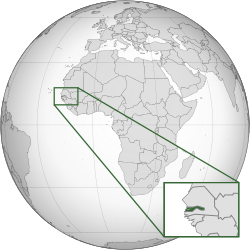 ↑ "The World Factbook: Gambia, The" (in en). https://www.cia.gov/library/publications/the-world-factbook/geos/ga.html. ↑ ۳٫۰ ۳٫۱ ۳٫۲ ۳٫۳ "The Gambia". International Monetary Fund. http://www.imf.org/external/pubs/ft/weo/2017/02/weodata/weorept.aspx?pr.x=26&pr.y=15&sy=2015&ey=2022&scsm=1&ssd=1&sort=country&ds=.&br=1&c=648&s=NGDPD%2CPPPGDP%2CNGDPDPC%2CPPPPC&grp=0&a=. د نۊ زنٱ بیٱ د"https://lrc.wikipedia.org/w/index.php?title=گامبیا&oldid=104966"
اؽ بٱلگٱ ایسنؽا آلشت بیٱ د ‏۱۲ فڤریٱ ۲۰۱۹، د ‏۱۹:۲۸.